This '99-2000 era '57 RI in aztec gold, sports Callaham bridge, pots, switch & jack-- the pots & switch are Callaham's cryo treated components. Bridge pickup is a Duncan '52. 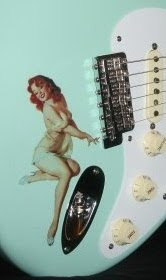 Another nice touch includes an aftermarket pearl pickguard & matching back cover. The tweed case & case candy comes along. 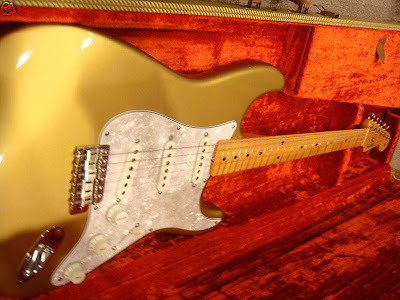 The Strat is currently for sale at the Main Street Music eBay Store as a Buy It Now listing. Check 'em out for seller & item details & more photos. For this week's Friday Strat, we recommend the following food & beverage selection. FOOD: Smoked turkey sandwich on light rye, with super twangy cranberry chutney & cream cheese. Kettle Brand Salt & Fresh Ground Pepper Krinkle Cut Chips (put' em in that sangwich they're THICK!). BEV: Trumer Pils, German Style Pilsner by Trumer Brauerei Berkeley.